KIEV, Ukraine -- Luxury holidays enjoyed or planned by Ukraine's President and Prosecutor-General revealed by media have sparked uproar in a country battling large-scale corruption - though the latter played down the claims on Wednesday. Poroshenko and 10 other people went on a secret seven-day vacation on a private island in the Maldives. Soon after the New Year, President Petro Poroshenko and 10 other people including friends and family went on a secret seven-day vacation on a private island in the Maldives, spending some US$500,000, Ukrainian investigative TV show Skhemy reported on Jan 18. Tuesday, the same show revealed an expensive family vacation for Ukraine's Prosecutor General Yuriy Lutsenko in the Seychelles, estimating the cost at more than €52,000 for three people. 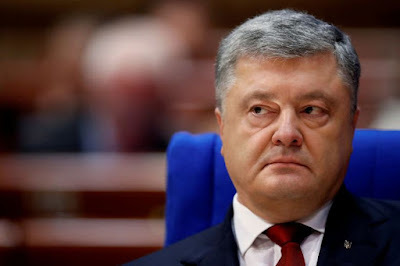 Poroshenko's press-office told a Ukrainian news agency after news of his pricy break first emerged he had enjoyed "a short rest" and that he "paid for the trip himself from his own account" which he would be listing in his earnings and expenditure submission. "For those worried about my expenses, at the end of September my older son got married and postponed a traditional honeymoon at a later date," Lutsenko posted. "In 2018, Iryna, my wife, and I celebrate our 30th wedding anniversary and we've decided to travel in January as a family and share a vacation," he added. He also published pictures confirming that he donated 450,000 hryvnya ($16,000) to help soldiers wounded by Russia-backed rebels in a conflict that has already killed more than 11,000 people in country's east. "It's time for travel agencies to launch tours 'following Poroshenko and Lutsenko': Maldives - Seychelles - Panama," Ukrainian MP Sergiy Leshchenko wrote on Facebook, alluding to the recent Panama papers leak that revealed Poroshenko's use of offshore accounts. "And we all need to send them along the route: "resignation - investigation - court," Leshchenko added. The new authorities who came to power after the revolution made some positive changes in reforming Ukraine, but Ukrainians as well as the country's Western allies still fear the interests of oligarchs and tycoons will come first.